BITSAT 2019 Registration Started : BITSAT 2019 Application Form / Apply Online process will be commenced @ bitsadmission.com. BITSAT application form 2019 date has been announced and the details are given on BITSAT official website. BITSAT 2019 will be a computer based test to be conducted on all India basis by Birla Institute of Technology & Science, Pilani for admissions to various pharmacy, science and engineering programmes of BITS, Pilani at Pilani campus, Hyderabad campus and K. K. Birla Goa campus. 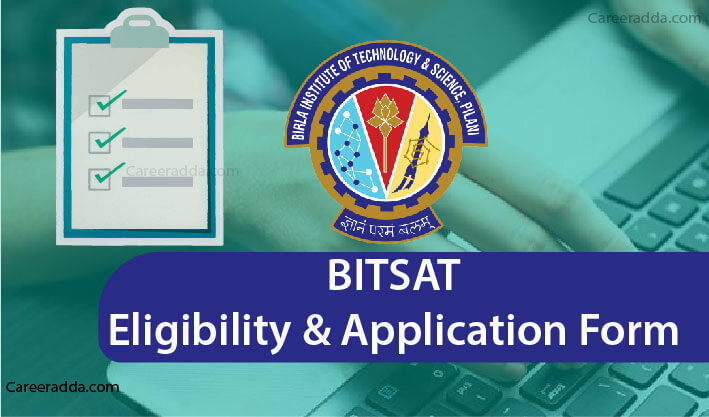 Interested candidates are required to fill and submit BITSAT 2019 online application form before deadline i.e. 13th March 2019 (5.00pm). BITSAT 2019 application form shall be available online on BITSAT official website. Before filling and submitting the application, you will be needed to go through BITSAT 2019 registration process. It is a one-time mandatory process. But before all this, you must check eligibility conditions to appear in the BITSAT 2019 test. Student must has passed the class 12th examinations with Physics, Chemistry and Biology and have adequate proficiency in English from a recognized Central / State board or its equivalent. However, students having the following subjects may also apply for B. Pharm. – Physics, Chemistry and Mathematics. Students must have passed the class 12th examinations with Physics, Chemistry and Mathematics and adequate proficiency in English from a recognized Central / State board or its equivalent. If you are eligible as per the above-mentioned conditions then you can apply for BITSAT 2019 exam by filling and submitting the online application available on BITSAT official website. How To Fill and Submit BITSAT 2019 Application Form? Male candidates will have to pay an amount of Rs. 2950/- (two thousand nine hundred fifty) towards BITSAT 2019 fees and female candidates will have to pay an amount of Rs. 2450/- (two thousand four hundred fifty) for the same. If any candidate will select Dubai as a test center then s/he will have to pay an amount of Rs. 4500/- or US $70. All the candidates can pay their BITSAT 2019 application fees by using credit / debit card. Fees can also be paid through internet banking service and by submitting cash at any ICICI bank branches in India along with a specially generated pay-in slip. Foreign aspirants are required to pay BITSAT 2019 exam fees by using International Credit Cards and Debit Cards. For more details, please go through BITSAT 2019 official notification. Before applying to BITSAT 2019, candidates are required to keep the following documents in order to submit all the fields of BITSAT 2019 online application. Q . How To Access BITSAT 2019 Online Application? Ans. BITSAT 2019 online application can be accessed through BITSAT official website. The URL is bitsadmission.com. Before accessing online application, candidates must check eligibility conditions as mentioned above. Q . I Have Passed My Class 12th Examinations In 2016. Am I Eligible To Apply For BITSAT 2019? Ans. You are not eligible to appear in the BITSAT 2019 test. Q . What Is The Last Date To Apply Online For BITSAT 2019? Ans. The last date to apply online for BITSAT 2019 is 13th March 2019 (5.00pm). Q . What Is BITSAT 2019 Date? Ans. BITSAT 2019 exam shall be conducted by BITS, Pilani between 16th May to 31st May 2019 [tentative]. Exact dates of BITSAT 2019 exam will be disclosed soon. Q . Is It Possible To Edit or Make Corrections In BITSAT 2019 Online Application? Ans. You can edit your BITSAT 2019 online application between 15th March 2018 to 19th March 2019. During this period, link for editing the application form will be activated by BITSAT conducting authorities.